This is one of my favourite aviation stories of all time, honestly, just for the headline potential. 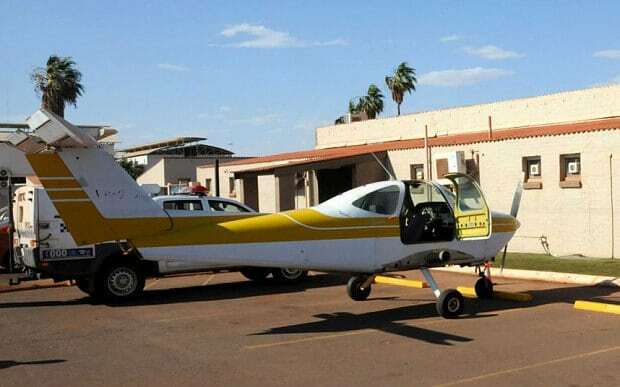 A 37-year-old Australian purchased a Beechcraft two-seater aircraft which, for reasons that are never sufficiently explained, did not have wings. 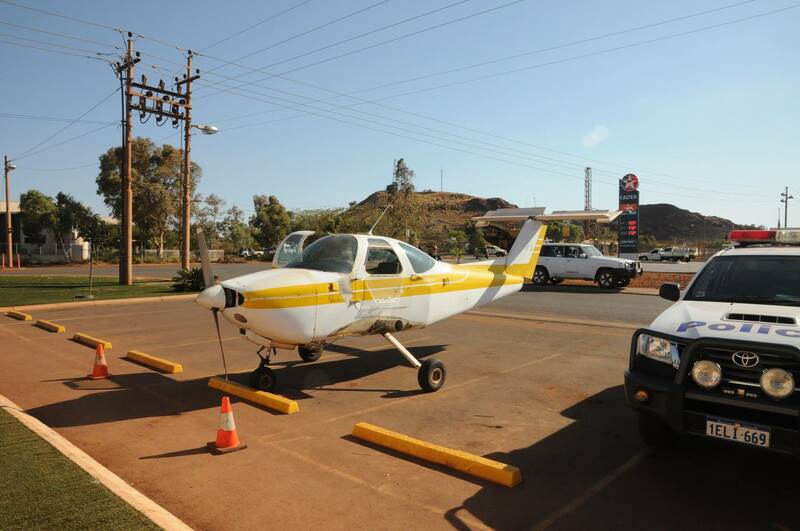 He was transporting the newly purchased aircraft by, well, taxi-ing it through Newman to his home which was on the other side of town. On the way home, a great thirst (and possibly the desire to show off his new purchase) overwhelmed him, so he stopped at the Newman Hotel to have a drink at the hotel bar, The Purple Pub. The gentleman in question does not have a pilot’s licence. He did, however, manage to park between the lines, which is more than you can say about the police car in the same photograph. They confirmed that the man passed a breath test for alcohol and did not cause any traffic accidents and did not attempt to avoid arrest. “I’m confident that he will be charged with something soon,” said Mark McKenzie, the local police sergeant. I shouldn’t laugh, because of course it wouldn’t be difficult to find an appropriate offences and I sure wouldn’t want MY kid running across the road to check out the real plane with the live propeller. But it’s pretty clear from the quotes that the policeman on the scene was way out of his depth. Local news, also unclear on the basics of aviation, reported that the aircraft travelled down the street with its propeller running and was, shock horror, being steered by foot pedals. The policeman also said that the fact that the plane did not have a steering wheel made the situation very dangerous. The only authority with the actual aviation knowledge to deal with the case would be CASA, but as the vehicle had no wings and the driver didn’t have a pilot’s licence, I’m not sure this would actually be within their remit. In any event, the man was quickly charged. Although I’m picking on the police and journalists for not understanding aircraft, I have to admit, I’m embarrassed to admit that it didn’t immediately strike me that a Beechcraft Skipper with no wings also doesn’t have a fuel tank. It turns out that the fuel was in a jerry can sitting in the back seat with tubing running along the outside of the aircraft to the engine. The Australian was accused of leaving the engine in a potentially dangerous condition with the ignition on with a charge of ‘Endanger Life, Health or Safety of a Person’. I don’t really feel like this kind of action should be encouraged but at the same time, really? The problem isn’t the prop, it’s the ignition? In the end, the prosecution did focus on the issue of the propeller running as it taxied drove down busy streets with many pedestrians. The owner of the aircraft pleaded guilty and was fined $5,000 plus court and towage costs. I suppose at least they saved him having to push it back across the parking lot. 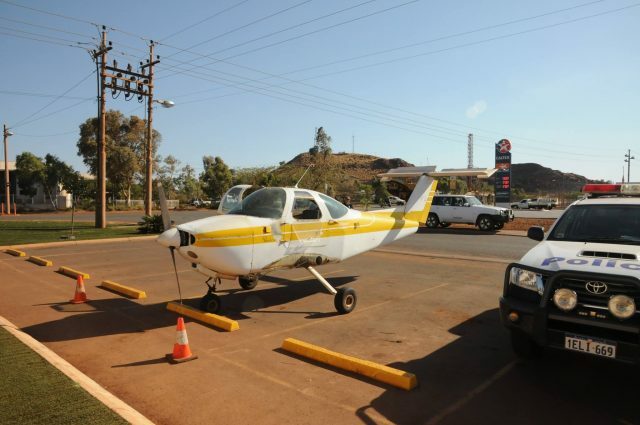 He told the press that he was keen to restore the Beechcraft once it was returned to him by police but no, he wasn’t planning on further excursions across the mining town. The police managed to get a better spokesman by the end of the debacle, who told the press that he appreciated that there was a lighter side to the story. I have indulged in quite a few beverages with this incredible man and am proud as punch to say he is my friend. He is a character and has on several occasions made me laugh so hard I suffered from extreme soreness in the belly regions. He is extremely intelligent and lives the dream with his lovely wife and children, although I wonder how long his wife’s sanity will last. Yes, I can imagine being married to this person would be quite a trial in itself! It seems likely that if he had driven straight home instead of pulling into The Purple, he would have avoided arrest, and his vehicle would not have been towed. If you are doing something that is not against any current law but is sure to result in a new law being enacted against it, stop off for a celebratory quaff before or after the deed — not during!